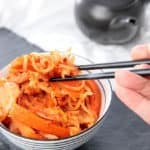 This is the most popular Kimchi variation. Kimchi Baechu, made with nappa cabbage and chili. Coarsely chop the cabbage and reserve. Cut the shallot into 2 cm pieces and add to the reserved cabbage. Shred the daikon radish by hand or chop in the TM. Add 150gm daikon in the TM bowl. Chop 4sec /Speed 5. Transfer the daikon to TM bowl of cabbage. Repeat the process until all the daikon is chopped. Add 150gm carrot in the TM bowl. Chop 4sec /Speed 5. Transfer the carrot the bowl with the cabbage. Repeat the process until all the carrot is chopped. Mix the water and salt in a large non-reactive bowl until dissolved. Add the vegetables to the brine and submerge them fully for 3-4 hours or overnight. Drain the brine off the vegetables. Make sure to reserve the brine. Place the ginger, garlic and onion to the TM Bowl. Mince 5 sec/Speed 9. Add the Korean chilli and fish sauce (or 1/2 cup of brine if vegetarian) to the garlic mixture. Combine 15 sec/Speed 6.5. Add the Kimchi paste to the drained mixed vegetables. Mix the paste through the vegetables thoroughly, until they’re completely covered. Lightly press the kimchi into a 2 litre fermenting crock. The brine will rise to the top of the vegetables as you press. If necessary add a little more of the reserved brine to completely submerge the vegetables. Place a crockery weight on top of the vegetable to keep them submerged as they ferment. Cover the jar or the crock lid to deter unwanted insects or particles. They won't be able to get in the crock but as water bubbles out onto the plate they may be attracted. The fermenting crock can sit on the kitchen bench away from sunlight until it's ready. The fermentation will take between 4-8 days depending on the outside temperature and your desired level of funkiness.